"Among democratic nations, . . . all the citizens are independent and feeble; they can do hardly anything by themselves, and none of them can oblige his fellow men to lend him their assistance. They all, therefore, become powerless if they do not learn voluntarily to help one another." It's a VERY hot July weekend here at Hodapphaüs, and I stare at my backlog of unwritten articles, missed deadlines, ungraded essays, and half-finished emails with dread. I'm doing it. I'm doing it. This really isn't going to be another one of Hodapp's wheezy posts about lost temples, and yet it will seem like it, because they are a symbol (like so much else in Freemasonry). Nonetheless, I'm in a despondent mood, possibly from reading too much about Masonry's past a lot lately. I just reacquainted myself with Arthur Schlesinger's "Biography of a Nation of Joiners" (1944) and Charles Merz' "Sweet Land of Secrecy" (1927), both describing the height of the Golden Age of Fraternalism in America (you can find both in the excellent collection Secret Societies in America: Foundational Studies of Fraternalism, edited by Will Moore and Mark Tabbert). That period coincided with our greatest building boom. And it finally occurs to me that the biggest ill ailing Freemasonry in modern times has absolutely zero to do with "modern man," not enough discretionary time and income, raising kids and conflicting soccer practices, falling morals, dramatic loss of religious faith and traditions, anti-Masonic forces, public perception, the Internet, streaming television, smartphones, not enough publicity, or expensive dues (don't make me laugh uncontrollably and pass my Diet Cherry Dr. Pepper through my nose). Nope, it's much simpler than any of that. At every explosion of Masonic membership in America, we shared our spoils with (and also spawned) an ever-increaing number of imitators. In the time after our American Revolution, scores of scientific, philosophical, literary, and other self-improvement societies took off like wildfire to bring European and Enlightenment-era concepts to the new country and educate a rugged and growing population that was headed westward. After the Civil War, Masonic grand masters all over the country railed against the chartering of too many lodges too quickly, but to no effect — the membership went up and up. And we suddenly had stacks of competing orders all chasing the returning veterans to fulfill the sense of fraternalism they shared in the military that was now lost. Same way after WWI ended, through the '29 Depression, when there were close to 1,000 other fraternal associative groups in the country. Millions upon millions of Americans belonged to one or more of these orders, and they all needed a hall to meet in, dues to be paid (and kept competitively low), scores of officers to fill stations, ritualists to enact parts in their theatrical initiations, volunteers to cook dinners and undertake community projects, and members to line the sidelines. Churches competed for almost the exact same people for many of the same jobs and similar levels of participation. That's when Freemasonry built our most magnificent, landmark temple buildings, because so was everyone else. Forgive the local nature of these observations, but in my home town of downtown Indianapolis, of the classic "secret society" fraternal groups, only the Freemasons retain our big and impressive post-WWI clubhouses: Indianapolis Freemasons Hall (1909), the Scottish Rite Cathedral (1929), and at least part of the Murat Shrine Temple (the 1958 expanded clubhouse side, though the theatre side built in 1909 was leased to others long term). 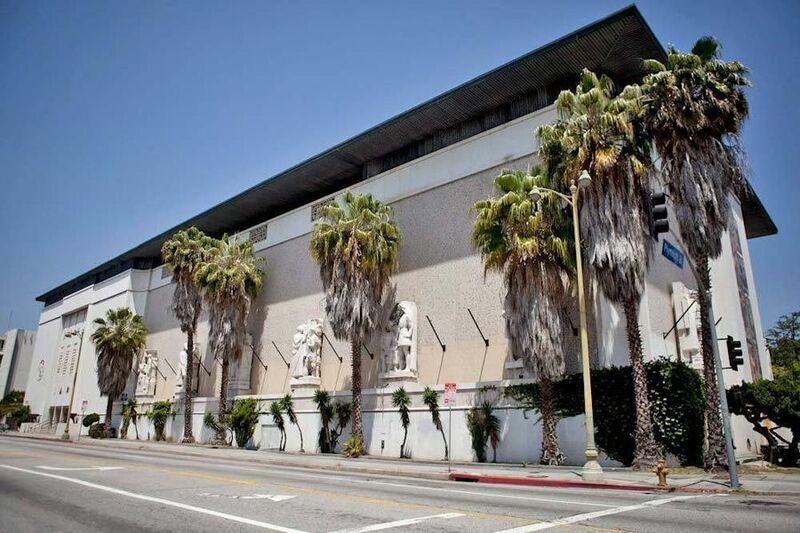 Several Prince Hall lodges (including Central Lodge 1 PHA) and appendant bodies banded together as the Prince Hall Masonic Temple Association in the 1980s and bought the former Oriental Lodge 500 Temple (1916) on Central Avenue, and so even it, too, remains as a Masonic building today. 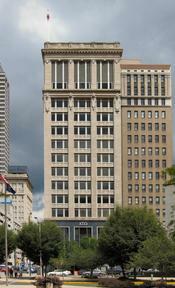 The only other large and impressive fraternal structures that remain within downtown Indianapolis are the former Odd Fellows tower (1908) at Washington and Pennsylvania Streets, and the beautiful, white glazed porcelain brick, former Knights of Pythias building (1925) on Meridian Street (even it was not a meeting hall, but originally housed the offices of their once burgeoning insurance program). When Indiana's Freemasons celebrated our 150th anniversary in 1968, neither of those two other groups owned their buildings, and were already mere ghosts of their former selves nationally - the Odd Fellows are down to a mere four lodges left in all of Indiana, according to their Grand Lodge website. There's still the good sized Knights of Columbus McGowen Hall (1922) on Delaware Street, but the recently abandoned American Legion Headquarters (1927) anchoring the now incongruously named 'American Legion Mall' sits vacant. The Athenaeum (once Das Deutsche Haus, built in 1893-98) is still the home to a variety of German-related clubs and groups, but these never been what anyone would consider "secret society" sorts of places. There are other local, former fraternal buildings dotted around our downtown area, but none of them retain their original ownership and purpose of being a meeting hall for initiating and gathering their members. When these other halls were built in the 1920s, the Freemasons were the pinnacle of fraternalism in a very crowded field. If we were the top of the heap, we were the gold standard. That was our reputation to the outside world, and inside of our own lodges, too. We built great temples and did great things because we thought the best of ourselves, and in many ways, attracted only the best of men because of that. And today, for all intents and purposes, we are all that's left. The Odd Fellows formed in 1730 and were once larger than Freemasonry in national membership. Today, they are down to under 600,000 worldwide (or a million, depending on how you count and whom you ask, since they also have recognition and regularity issues, and nobody likes to admit falling membership to outsiders anyway). The Knights of Pythias were down to 50,000 in 2003, and don't want to talk about numbers anymore. The Woodmen of the World claim 900 chapters nationwide, but they are largely an insurance company, and have been for decades. They just "rebranded" themselves as WoodmenLife. The Foresters and the Macabees went the insurance route, and are essentially gone. The Redmen are mostly vanished, and if there's an aging member of the Tribe of Ben Hur out there anywhere, send me a note. The Moose, Elks, Eagles and others cling on as social clubs (and remain popular in pockets of the country), but the Owls and the Oaks are gone. So are hundreds and hundreds and hundreds and hundreds of other major and minor groups (take a stroll through the Rathbone Museum in Lafayette, Indiana sometime—that's their photo at the top of this post). The world became an ever-increasingly impersonal place, we all stopped dealing face to face, and a handshake stopped meaning anything besides a involuntary reflex greeting like saying "Hi!" or "Have a good one!" Person to person, middle-class jobs and relationships vanished, communities died, people retreated to suburbia and one year lease apartments, and the fraternal groups closed one by one. Now, Freemasonry is the last order standing, in the world of the formerly large, non-sectarian "secretive societies." We have no reason to be better or more impressive or more selective or more interesting than the other "dues-card-and-a-pin-I'm-in" orders, because there's no one else. And in all honesty, the world is not a better place for it, because the fraternal groups reinforced the sense of community that we don't share anymore. When the big fraternal groups competed to build the bigger or better buildings on our skylines, they signaled that our towns had lots and lots of citizens who cared very much for their communities. Now we pitch them overboard, build pole barns in cornfields, and offer little at our meetings to entice anyone to come back next month. Or join in the first place. Much less, to make large donations in their wills for us to do bigger and better things when they join the Great Majority. I coincidentally ran into two poignant blog entries found on other websites recently. The first is Robert Johnson's post a couple of weeks ago, Shadows Burned Onto the Walls - Addressing Freemasonry's Biggest Problem. 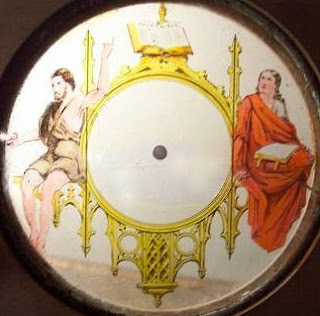 Read it over on the always excellent Midnight Freemason blog site HERE. The other entry I'll point you to is the haunting exploration of the former Los Angeles Scottish Rite Center by Brother Greg Stewart on the Freemason Information blog site: Something Lost: The Los Angeles Scottish Rite Cathedral. Built at enormous cost and with great care in 1961, yet essentially dead in (appropriately) just 33 years, the Cathedral was recently converted to a modern art gallery. Greg recently took a tour of the newly reopened building, and he echoes my own sentiments whenever one of our more magnificent temples gets consigned to the dumpster voluntarily by our own members. "I can’t say for certain if it was the space, the items in the space or the words taken in the context of the aforementioned relics of what Freemasonry once was. Leaving the relic room, I was moved to tears — not for the casual housing of materials sacred to me, but tears for what those relics once represented to the people in the space. To the owners of the history that poured the foundation and raised the marble edifice. 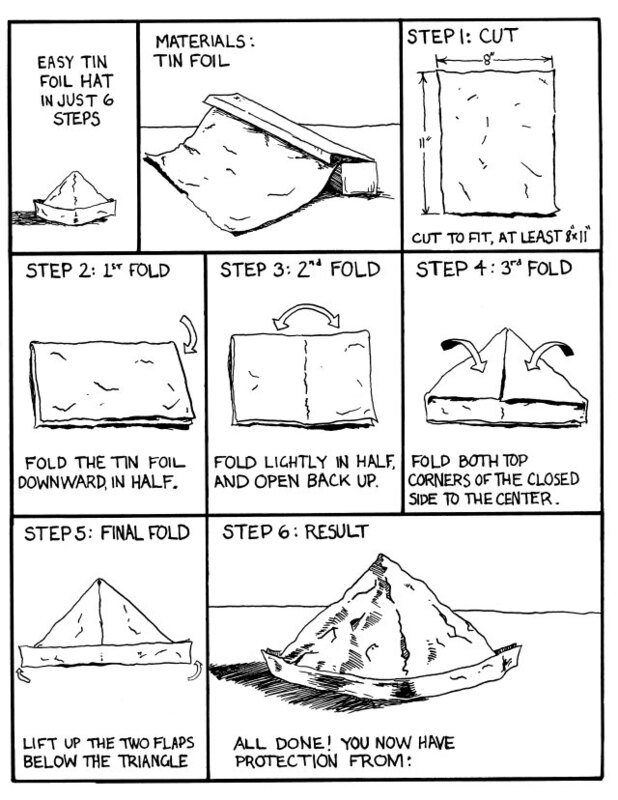 Perhaps more so, the thought that this was the future of Freemasonry. That an empty building full of abandoned “relics” was really what lay at the end of it all. Yes, the building is just a building, but it affects the priest no less to see the church he dearly loved, laid low by a fire or an earthquake. "Masons are builders and buildings can be replaced. But walking through the bones of a structure built to show the “intensity of feeling throughout history toward the Meaning of Masonry” felt like a priest walking through the ashes of his fallen church. "I wanted to feel optimistic about the space. I wanted to appreciate it for what it once was. Instead, I left haunted feeling depressed and overwhelmed. Not at the space or the modern art within its walls. I was haunted by the ghosts of what it once was." Columnist Salena Zito may or may not have realized that yesterday was St. John the Baptist Day and its importance to Freemasons when she wrote her essay for the Washington Examiner. 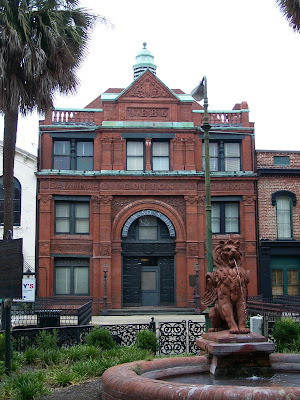 She was visiting Savannah, Georgia and was in the famous red brick home of Georgia's Solomon's Lodge No. 1 as their members streamed in. The landmark building was once home to the city's Cotton Exchange nearly two centuries ago, before the Masons of Solomon's Lodge bought it. 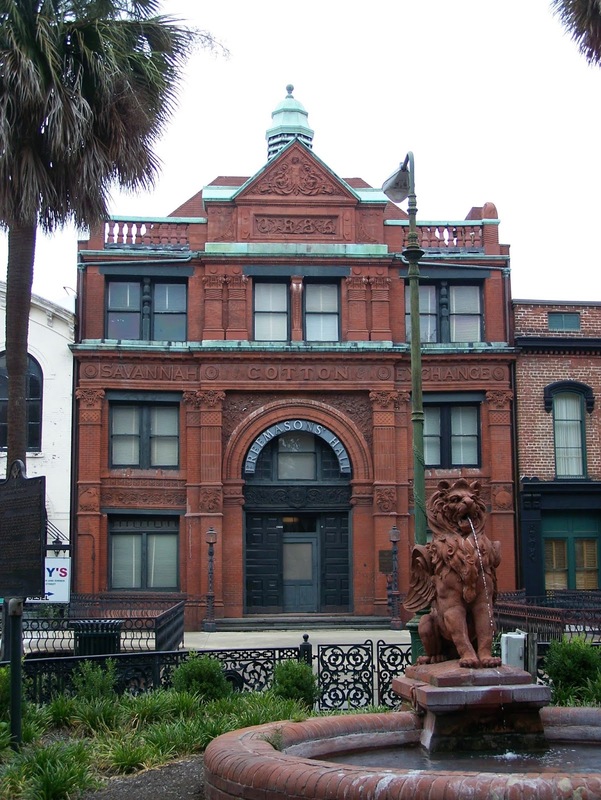 But in both of its historic roles over the years, that distinctive place has been a center of civic life in Savannah. I encourage you to read Zito's editorial (excerpted below), because it speaks about the vital importance of fraternalism in America throughout our history, and why organizations like the Freemasons are needed at this very moment in time more than ever. Freemasons are civic leaders, and the room is filled with men of all ages, races and backgrounds, about to meet over what they can do next to further the betterment of their community. They are members of a dying American tradition that once drew young men by the hordes, in particular after the end of World War II when memberships in fraternal organizations like the Mason’s, Elks, and Rotary Clubs swelled with young veterans reared on the ethos of community service. America today has a recession of civic activity as we emerge into a society that [is] less united in a common endeavor with fewer people willing to listen to elders who could guide young men and women with the skills of cooperation and citizenship. For the past 200-plus years Americans eagerly formed countless associations within their communities. It didn’t matter if their neighborhoods were in large cities, small towns, or spread out in expansive rural farming areas. We liked to form associations; a lot. Some were serious, some were frivolous, some had ties to commerce in a town or were wedded to a church and some were exclusive, but nearly all of them were formed to advance or foster a better community or a better city. But we don’t join things the way we used to. The question is why? The first obvious answer is we are busy, but so were our parents and grandparents and they joined the Rotary Clubs and Kiwanis. The second obvious answer is technology. It does everything for us and connects us to people instantly so why would we want to connect in person? You can answer that one by looking around yourself at an America with an eroded public square. Things are not going well. Traditional member-based organizations, especially the do-goody ones, rarely included politics and brought diverse different ideas together that helped make communities and societies form cohesively. They bettered the schools by providing funds for small projects. They bettered the parks by volunteering to weed, seed and keep the area tidy. They encouraged young people to join and mentor them towards improvement. And they avoided using the government for all of their tasks. It was a way to network and a way to support worthy causes. Today all of these organizations face memberships in the decline, as their members die out their influence does too – and that may not be a good thing. “This country would not have grown to be the great place it is today without the civic engagement that all of these different fraternal organizations have provided. We have to think ahead as to how to maintain them, they are and can still be the core of a civil society,” [Past Master Bryan] Hoffman says as the old trading floor, now complete with pale blue seating on three sides, fills up with members. Zito concluded her essay with an appeal to join the Rotary, and that's a fine idea. Service clubs like the Rotary, Kiwanis, Lions, and Sertoma are great organizations, and especially connect people in businesses, encouraging them to participate in their communities in countless ways. Like the Freemasons, they don't permit religious and political arguments to creep into their meetings — or at least they try not to, which can be tough given that businesses have to interact with government so much. In short, he'll treat you like what you are: his Brother. And you would do the same for him. Since the contraction of the larger fraternal groups like Freemasons, the Odd Fellows, the Woodmen, the Knights of Pythias, and so many others in the last 50 years, America and the wider world have lost something critical that few realized was so important at the time (De Tocqueville certainly recognized its importance in his day). 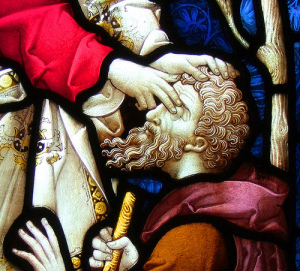 Fraternalism was one of those guiding hands on society's shoulder (like religious institutions) that helped keep the human animal from constantly going after the other guy's throat. 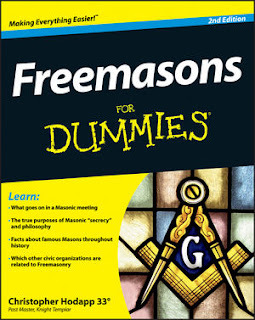 All those "famous Freemasons" who fill up Denslow's books who were senators, congressmen, presidents, statesmen, business leaders, innovators, and others who helped to craft and operate the levers of civilization found ways to get along with each other, to cooperate for the common weal, despite having wildly opposing viewpoints. People weren't any less passionate 100 years ago about laws or taxes or injustices or iniquities than they are today. But they got along with each other because when they weren't at work or at home, they were sitting side by side in church, or meeting on the level in their lodges, or both. We don't share much in common in Western society any more, now that we don't read the same papers, listen to the same radio stations, watch the same TV shows, and belong to the same clubs. We've all gone tribal, and that's a dangerous place to find ourselves, because it always stresses our differences, not what we share. In a country of 350 million people, tribes are likely to lash out when they feel under assault (whether it's true or not), especially now that we've redefined the smallest of slights and perceived insults as crime, and then given everyone an instant 24/7 media megaphone by putting a smartphone in every pocket. Technology isn't going to roll backwards anytime soon. So maybe it's time to consider the human alternative of finding ways to get along with each other again, face to face. There's a reason why Freemasons usually build our temples without windows, because inside you''ll find a sanctuary from all of the screaming and the noise outside. Knock on the door of a Masonic lodge - or if you're already a member and haven't been back in a long while, go to the next dinner or meeting. You can take your place along that endless chain of union that binds us to the Mystic Tie, and help us make a better world, one man at a time. His presentation will be: "When Worlds Collapse: Socrates, the Forgotten Mason." We are determined to complete our business in one hour. Visitors dress should be tuxedo, or business attire. Each attendee will be responsible for the cost of his and their guest’s meal. Since I just posted about Santa Fe's Scottish Rite Temple yesterday, it's appropriate for me to remind Masons that this year's Masonic Restoration Foundation Symposium will be held in Santa Fe, New Mexico at that very location. The annual MRF Symposium is a meeting place for Masons who are seeking the highest form of Masonic experience they can attain within their lodges, while strictly conforming to the laws, resolutions, and edicts of their respective grand lodges. It is a gathering for those who pursue quality in the Craft to share ideas and discuss their work. The Symposium will take place from August 10-12, 2018, and will be hosted by Montezuma Lodge No. 1 and Cerrillos Lodge No. 19, with part of the event taking place at the adjacent Santa Fe Scottish Rite Temple. As usual, the event will begin with a Festive Board Harmony held in the Dining Hall on Friday evening, conducted by the host lodge, and featuring comments from Keynote Speaker, Worshipful Brother John Bizzack, Master of Lexington Lodge No. 1, in Lexington, Kentucky, and author of Island Freemasonry. Other speakers on the program include: Oscar Alleyne, Douglas L. Caudle, Bo Cline, Patrick Craddock, Robert G. Davis, Andrew Hammer, Scott Jaquith, Thomas Pierce, Dago Rodriguez, John Tolbert, and MW Adam Hathaway, the Grand Master of New Mexico. Additionally, brethren will have the opportunity to attend a New Mexico Master Mason degree on Saturday afternoon. Registration for the complete Symposium is $125.00; $75.00 for the Saturday session only. Brothers who wish to attend only the Friday night Harmony will pay $50. 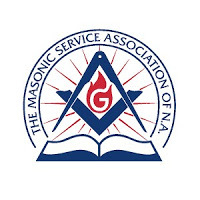 Any Mason in good standing may register for the Symposium, provided he is a member of a Grand Lodge which is a member of, or is recognized by any one of the Grand Lodges which are members of the Conference of Grand Masters of North America, or the United Grand Lodge of England, the Grand Lodge of Ireland, or the Grand Lodge of Scotland. The complete program and reservation information can be found on the MRF website HERE. In the last 15 years or so, there has been a growing interest by art historians and architectural preservation experts in something Freemasons have taken for granted for over a century – the practical ways in which we have performed and presented our degrees onstage. 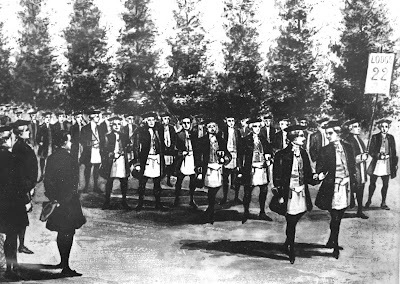 The dramatic presentations of Masonic and fraternal degree rituals reached their pinnacle in the United States at the turn of the last century in the purpose built theatres of the Ancient Accepted Scottish Rite. In the explosive period of growth from the late 1800s up through the beginning of the Great Depression, U.S. Freemasonry's ranks swelled to new heights, and this was coupled with the City Beautiful architectural movement that encouraged government and the private sector to design buildings to be timeless, majestic, and most of all, intrinsic to the communities in which they existed. Every architect had a copy of John Ruskin's The Seven Lamps of Architecture on his bookshelf as inspiration, and the greatest building boom of what were deemed 'important buildings' began. But along with the building craze among fraternal groups to out-do each other with their impressive clubhouses, there was a revolution going on in theatrical staging technology. New electric lighting, elaborate stage rigging and on-stage theatrical visual tricks, acoustic auditorium design, fireproofing, complex pipe organs with sound effects, and much more moved out of just Broadway and big city venues and fanned out into these enormous but private theatres constructed solely for the purpose of conferring fraternal degree rituals upon thousands of candidates each year. The fastest growing fraternal group in the U.S. during this period was the Scottish Rite, and for good reason. The Santa Fe, New Mexico Scottish Rite Temple, designed by Isaac Hamilton Rapp and opened in 1912 for the Scottish Rite Valley of Santa Fe, is a unique landmark Masonic building for a variety of reasons that extent beyond just its distinctive Moorish-revival, pinkish exterior (derided by some locals as "the Pepto-Bismol building"). Like so many other Masonic buildings across the country, it has teetered back and forth on prosperity or extinction over the years, as the fraternity wrestles with plunging membership, criminally low dues, too much real estate, and failure by our forefathers to create foundations and long-range planning. 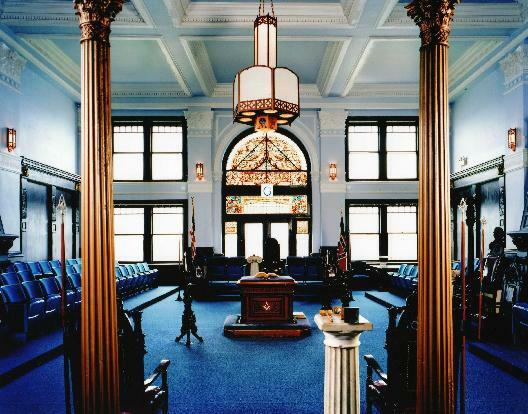 Nevertheless, there remains a longstanding interest by area Masons and non-Masons alike to preserve and maintain this particular unique Masonic temple, and it has recently been made available to the public for event rentals. 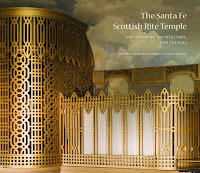 A new book has just been published that captures the Santa Fe Scottish Rite Temple in a unique manner. 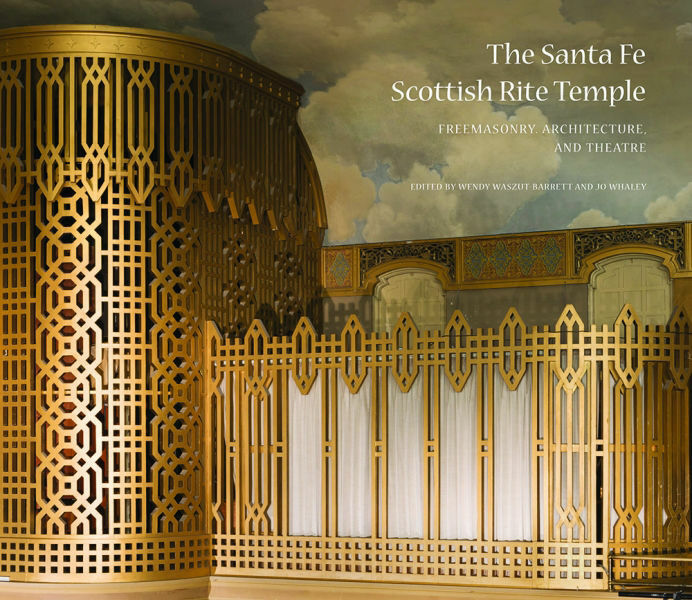 The Santa Fe Scottish Rite Temple: Freemasonry, Architecture, and Theatre edited by Wendy Waszut-Barrett with photography by Jo Whaley has just been published by the Museum of New Mexico Press ($39.95 hardcover). 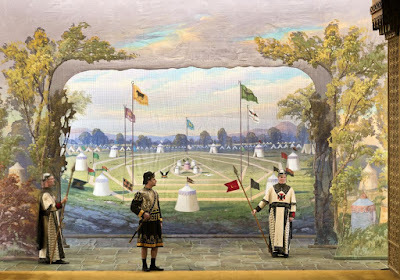 Nearly 150 photographs document the Temple inside and out, including images of every hand-painted backdrop used by Santa Fe to present the 29 degrees of the Scottish Rite of the Southern Jurisdiction. 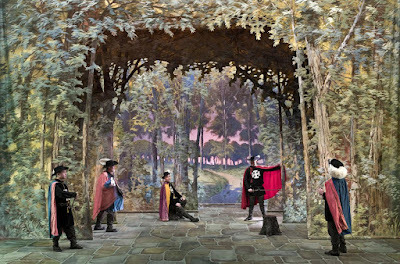 But in a departure from just flat photos of painted scenery, Whaley has brought them to life by populating every scene with Masons and other actors appropriately costumed as they would appear in each degree. 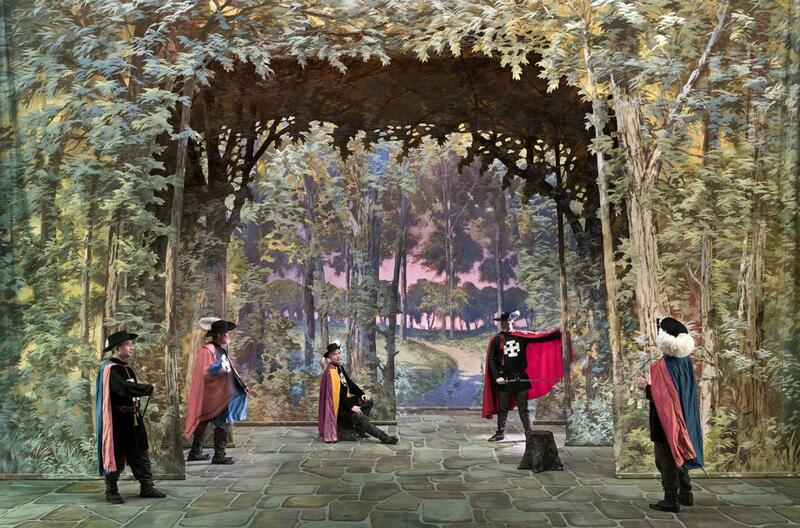 In 2000, Wendy Waszut-Barrett founded a company specializing in historic theater scenery restoration, and led the restoration of the Santa Fe Scottish Rite scenery collection starting back in 2002. Her illustrated article, “Theatrical Interpretations of the Indispensable Degrees” appeared in Heredom No. 12. 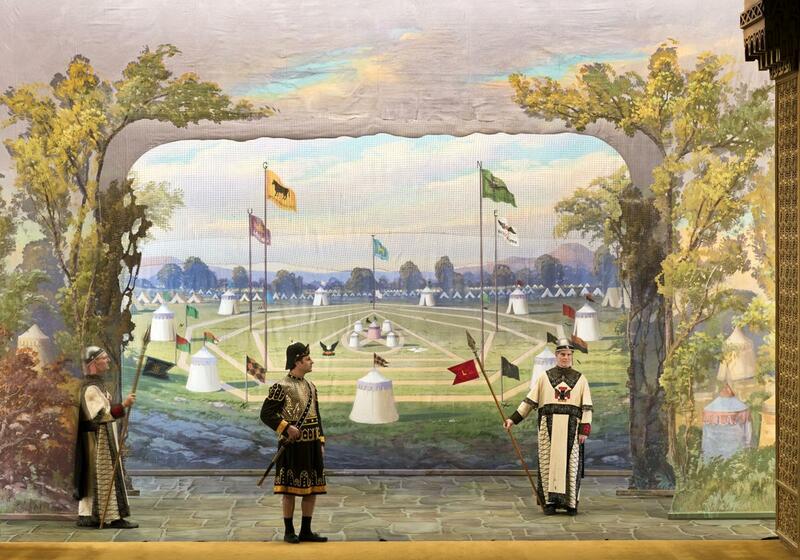 It discussed how the Scottish Rite grew so fast and so large, principally by its use of theatrical presentations. Today she is president of Historic Stage Services LLC in Minnesota, and is widely considered to be the top expert in restoration and preservation of these unique backdrops that we Masons (and those who inherit or purchase our abandoned buildings) tend to take for granted. 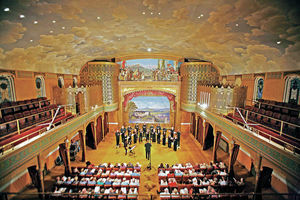 Today (Sunday, June 24th), there will be an open house, presentations, the kick-off release of the new book, and tours of the Sante Fe Temple between 4-6 p.m. Bagpiper Robert Schlaer will welcome the public at 4 p.m., followed by Eric Fricke playing the center’s organ, presentations by editors Wendy Waszut-Barrett (text) and Jo Whaley (photography), and then a “Scenic Spectacle” with Masons in costume and Morrow Hall playing the organ. There will also be tours of the building, book signings, and refreshments in the grand ballroom. The presentation and Scenic Spectacle repeat at 6 p.m. 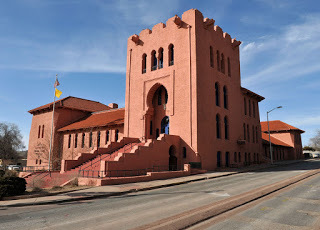 The Scottish Rite Center is located at 463 Paseo de Peralta in Santa Fe. 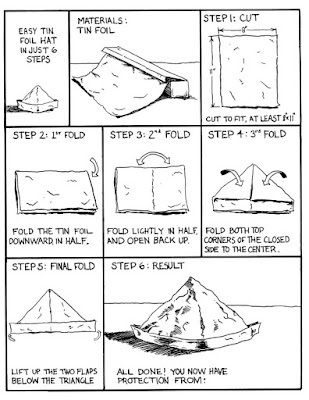 For much more information, see Making Like Masons by Paul Weideman on the Pasatiempo website today HERE. Incidentally, the Masonic Restoration Foundation 2018 Symposium will be held at the Santa Fe Scottish Rite Temple August 10-12th. CLICK HERE for more information. In our American Masonic ritual variations, one of the least understood symbols is this point within a circle, bounded by two parallel lines, with the volume of sacred law at the top. Like everything else within our symbolism, if you poke around into history and the origins of why we do what we do as Masons, much can be discovered in the tiniest of things. Today, June 24th, Freemasons celebrate the Feast of St. John the Baptist. A curious thing for a purportedly non-sectarian group to do. Freemasonry historically acknowledges St. John the Baptist and St. John the Evangelist as its patron saints, reveres their memory, points to their exemplary lives in its ritualistic work, and dedicates its lodges to them. In 1740, Chevalier Andrew Michael Ramsey, a Scottish expatriate living in France and Orator of the Grand Lodge of France, first suggested what morphed into the Templar theory of the formation of Freemasons. "During the time of the holy wars in Palestine, several principal lords and citizens associated themselves together, and entered into a vow to re-establish the temples of the Christians in the Holy Land; and engaged themselves by an oath to employ their talents and their fortune in restoring architecture to its primitive institution. They adopted several ancient signs and symbolic words drawn from religion by which they might distinguish themselves from the infidels and recognize each other in the midst of the Saracens. They communicated these signs and words only to those who had solemnly sworn, often at the foot of the altar, never to reveal them. This was not an oath of execration but a bond uniting men of all nations into the same confraternity. Some time after our order was united with the Knights of St. John of Jerusalem. Hence our lodges are, in all Christian countries, called Lodges of St. John." William Preston's Lectures, which is what our own degree ritual lectures are based upon (by way of Thomas Smith Webb in the U.S.), were the standard in the premiere Grand Lodge of England until the reconciliation between the "Ancient" and "Modern" factions in 1813, when a compromise was developed. References to the Saints were removed, the parallel lines were said to represent Moses and Solomon, and the lodges dedicated "to God and his service." Our English brethren removed the saints to eliminate any hint of religious sectarianism, but in so doing lost a vital aspect of Masonic symbolism and teaching in the process. The symbol itself is actually based on an ancient astrological and later alchemical symbol known by many today as a circumpunct (a term popularized in Dan Brown's Masonic-influenced novel The Lost Symbol). The point in the center (image at right) originally represented the Earth in some societies, which was thought to be the center of the Universe. The Heavens were believed to spin around the Earth, represented by the circle. Over time, the heliocentric theory of the Universe prevailed, and the circumpunct symbol settled into actually being representative of the Sun (Sol). As alchemy became established in the Renaissance, that science developed its own associative symbolism to depict elements. Seven particular metals were denoted to be essential planetary elements, principal among them being gold, which was thought to be the most perfect metal. Gold was associated with the Sun for its luminescence and color, and for its perfection. So its alchemical symbol also became that same point within a circle. As alchemy developed and became more intertwined with Qabalistic philosophies, some of its proponents like the revolutionary 16th century scientist Paracelsus suggested that celestial bodies affected different parts of the body, and associated the heart with the Sun. So, this is probably the evolution of how Freemasonry first adopted this symbol of the Sun and gold to represent the human soul or conscience that strives for perfection, and its relation to both Mankind and to the universe that revolves around us in our own little personal orbits. 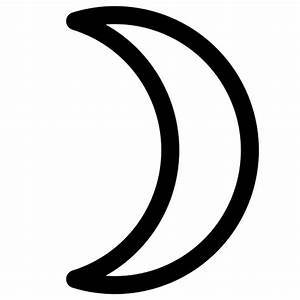 The two parallel lines were eventually added to the astrological version of the Sun symbol, and represented the summer and winter solstices, the longest and shortest days of the year. For thousands of years, these two days six months apart were celebrated as pagan feast days all over the world, and they were especially important to farming societies, because they were the astronomical methods of calculating planting seasons. In about 300 A.D., the early Catholic Church began to dedicate popular pagan feast days to the saints. June 24th, the longest day of the year, was declared St. John the Baptist day, while December 27th, the shortest day, was dedicated to St. John the Evangelist. Collectively, Masons refer to them as the Holy Saints John. Operative Freemasonry was first developed when Roman Catholicism was the prevailing religion throughout the Western world, and these feast days continued under the Church of England. It was common for guilds and other trade groups to adopt one or more patron saints. Some operative masons picked both Saints John, and over the centuries speculative Freemasons commonly celebrate these feast days with banquets. And curiously, even though Freemasonry today is non-denominational and non-sectarian, American Masons have retained these customs of old. 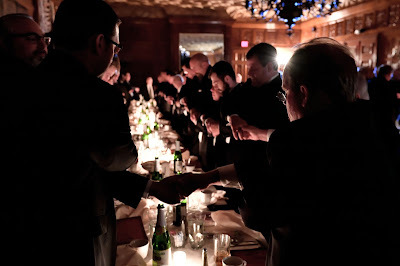 Most rituals in America say that Masons come “from a lodge of the Holy Saints John of Jerusalem,” while in other parts of the world, lodges are dedicated to King Solomon. But what is the practical application of this sort of symbolic dot connecting? Consider that John the Baptist was zealous, while John the Evangelist was learned, and by picking both of them as patron saints, Masons symbolically united — and juxtaposed — both passion and reason, keeping them both in balance at all times, again "with equal regularity." 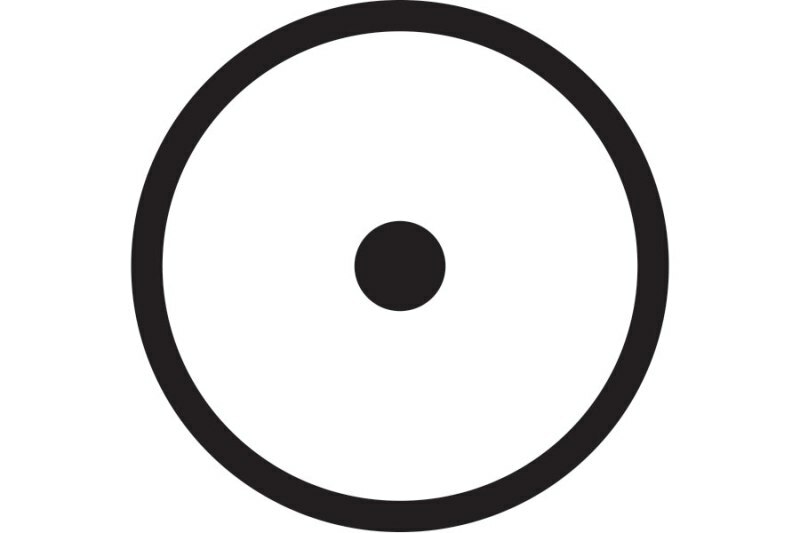 The symbol also depicts the Holy Bible or Volume of Sacred Law at the top of the circle. In Masonry, the point represents the individual, and the circle is the boundary of his actions. Taken as a whole, this combined symbol embodies the lesson that a Mason should consult the sacred texts or teachings of his own faith to achieve the proper balance between passion and intensity on one side, and knowledge and education on the other. In other words, he should balance education, excitement and faith to effectively subdue his passions. Taken as a whole, it is a graphic representation of the conscience, the soul, and the struggle to achieve perfect emotional balance and mental perfection. In other words, to "Know Thyself." This week, Brother Jason Liversidge in England posted this video on Youtube concerning his initiation into a lodge within the Provincial Grand Lodge of Yorkshire and East Ridings of the United Grand Lodge of England. He is truly a unique individual. 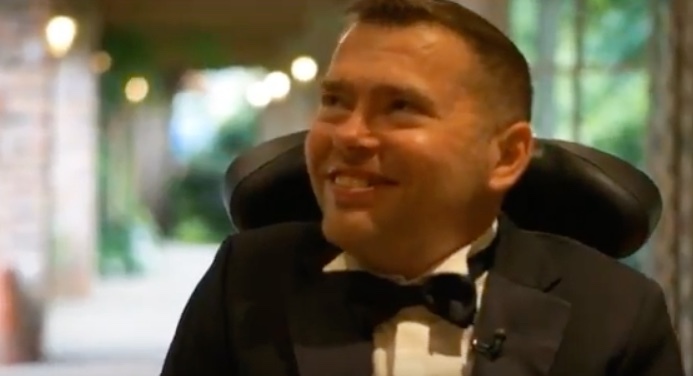 Jason is almost completely paralyzed and suffers from Motor Neuron Disease (MND). 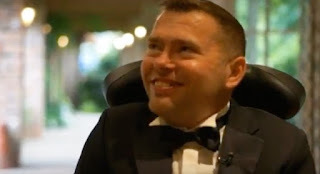 He is confined to an electric wheelchair and communicates via a computer speech synthesis voice, much as the late Stephen Hawking famously did throughout his adult life. But that hasn't stopped him from activities like parasailing, riding in a Formula 1 racing car, and other out of the ordinary experiences. And he is now counted among the largest and greatest fraternity in the world. Different jurisdictions throughout the Masonic world have varying requirements concerning petitioners for the degrees. Up until about 50 years ago, it was commonplace for grand lodges to have a so-called 'doctrine of physical perfection.' Indiana actually had a rule until the 1970s that any man wearing a hernia truss was ineligible for the degrees of Masonry. Others forbade men with missing limbs - even veterans - for a variety of reasons. But with the passage of time and modern day awareness of people with disabilities, numerous grand lodges have relaxed this requirement. Some have removed restrictive rules, while others have granted dispensations for extraordinary circumstances. It seems tragic to turn away an excited and dedicated man, or one who has a family history with the fraternity, because he is blind, is missing fingers, or can't kneel or walk a floor with squared corners. Here in Indiana, we established Bartimaeus Lodge U.D. as a special purpose lodge back in 1961. Made up of members from all over the state, Bartimaeus Lodge is called upon in a wide variety of situations to assist with, or fully confer, the degrees of Freemasonry when a candidate has special physical needs as a result of a disability. The lodge is appropriately named after the blind beggar whose sight was restored by Jesus on the road to Jericho, as told in the Book of the Apostles of Matthew and Luke, and actually identified by name in the account by Mark (10:46-52). The lodge's mission is to permit candidates who are handicapped to experience the degrees of Masonry as closely and as properly as their abilities will permit. Since its formation, they have initiated, passed and raised countless Indiana Masons who are blind, deaf, infirm, confined to wheelchairs, and much more. The Grand Lodge subsequently voted to approve the motion that recognition be withdrawn from the Grand Lodge of Albania with immediate effect. This photo has been flying around social media all weekend, and already the howling has begun. Yes, I know, it looks like President Trump is holding a white lambskin Masonic apron. No, Donald Trump is NOT a Freemason. 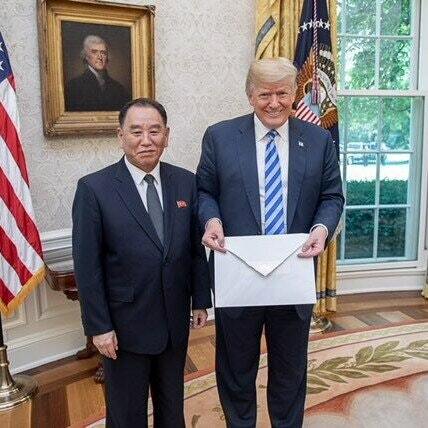 And no, it's NOT an apron, but a diplomatic envelope being delivered to the President by North Korean envoy Kim Yong Chol. 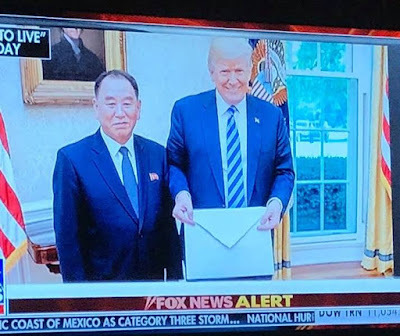 And while it's remotely possible that there is a minuscule handful of Freemasons alive in North Korea these days, it's NOT likely, and Kim Yong Chol in particular is one of the last guys on Earth who would be associated with it. And no, it's NOT "significant" that Thomas Jefferson's photo is hanging in the background, because no, Thomas Jefferson (the THIRD President!!!) was NOT provably a Freemason — much less a 33rd degree one (however, if anybody can dig up an authentic record saying otherwise either from his days in Paris or the lodge in Charlottesville, you'll get extra green beans with your steak dinner). But for those of you who still believe this nonsense, here you go. The generic foil works just as good as the expensive Reynolds Wrap. Disaster Relief Appeals currently in effect. 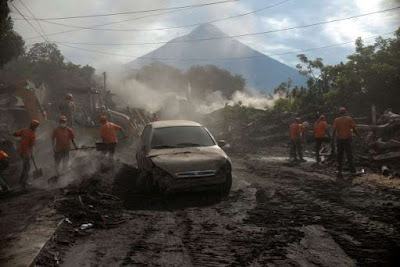 The Fuego Volcano in Guatemala erupted with terrible force on June 3rd, killing many and burying hundreds more. Authorities reported at least 109 people were killed when the volcano exploded Sunday, and there are nearly 200 listed as missing so far. Guatemala's government suspended the search for the dead Thursday, saying wet weather and still-hot volcanic material were too dangerous for rescuers. Volcanic ash has fallen over half of Guatemala where agriculture is crucial. Further eruptions and seismic events are expected. 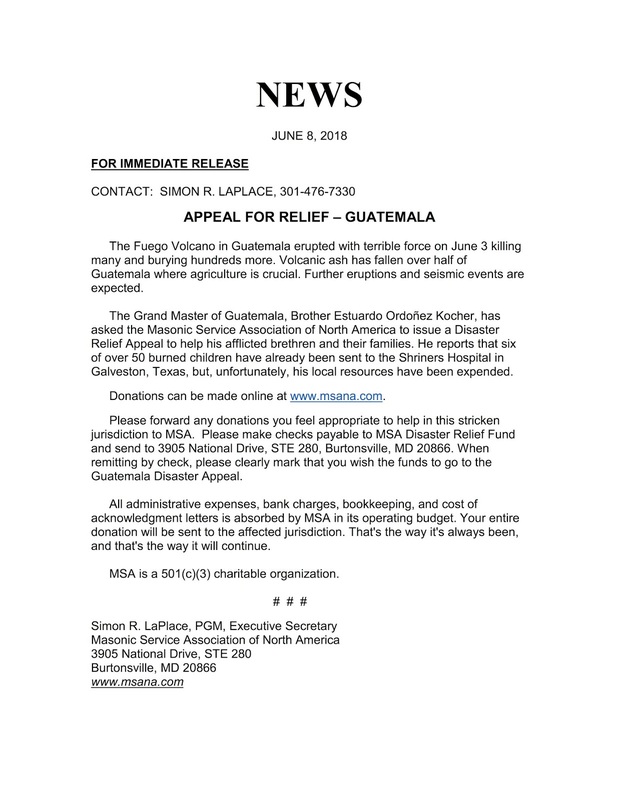 The Grand Master of Guatemala, Brother Estuardo Ordoñez Kocher, has asked the Masonic Service Association of North America to issue a Disaster Relief Appeal to help his afflicted brethren and their families. He reports that six of over 50 burned children have already been sent to the Shriners Hospital in Galveston, Texas, but, unfortunately, his local resources have been expended. 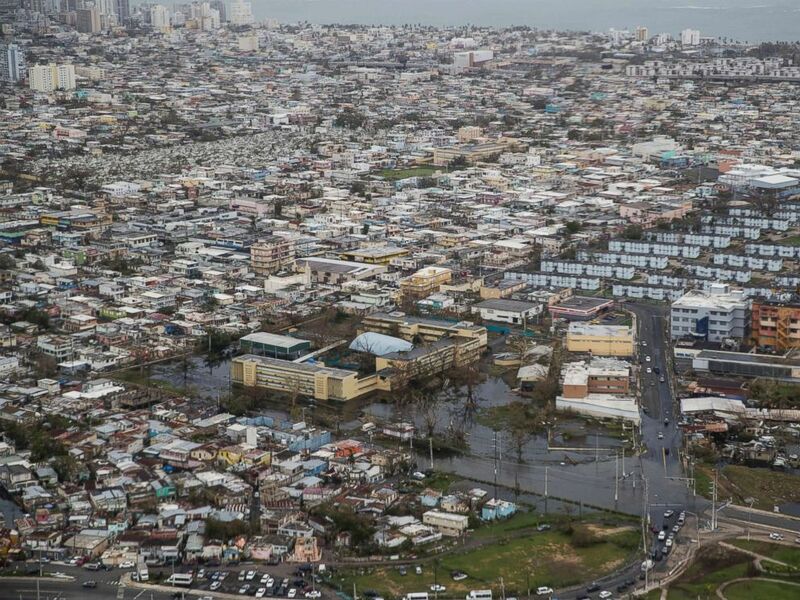 Meanwhile, as hurricane season begins this month, experts are still trying to count the number of deaths caused by last September's two devastating hurricanes, Irma and Maria, hitting Puerto Rico. The government’s tally of 64 people dead from the storms was a dramatic undercount, and there is widespread evidence for hundreds of storm-related deaths in the weeks after the hurricanes. Winds, flooding and landslides swept away homes and knocked out power, water and cellular service, which remained largely unrepaired for months. There are still large areas of the island today that remain without electricity and water. 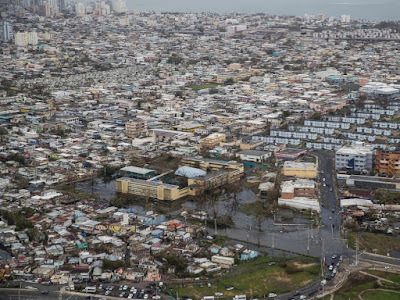 Puerto Rico's Grand Master Raúl Rodríguez Quiles contacted the Masonic Service Association of North America last October asking for help for the brethren of his jurisdiction by issuing a Disaster Relief Appeal. That appeal is still active at this time. When remitting funds to MSA, please mark checks, "Guatemala Disaster Appeal" or "Puerto Rico Disaster Appeal." 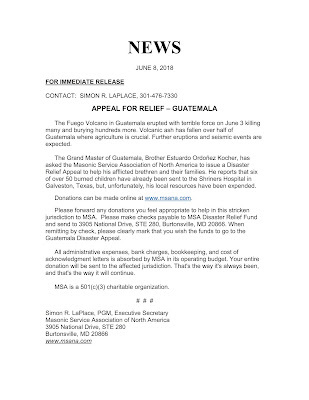 The Masonic Service Association is arguably the best and most effective way to provide financial assistance to Guatemalan and Puerto Rican Masons (or to any other jurisdictions that may also request these official Disaster Relief Appeals through MSA). MSA is a 501(c)(3) charitable organization. That is important to remember, especially if you, your company, or foundation are making a large donation and are in need of a tax deduction in return. The charitable arm of the Masonic Service Association was specifically established for the purpose of raising tax deductible donations, and to effectively distribute and account for the funds provided to Masons who receive assistance. MSA is often asked if any of your contribution is deducted for administrative expenses, and the answer is "No." All expenses, charges by PayPal, bookkeeping, or cost of acknowledgment letters, everything, is absorbed by MSA in its operating budget. Your entire gross donation will be sent to the affected jurisdiction. That's the way it's always been, and that's the way it will continue. 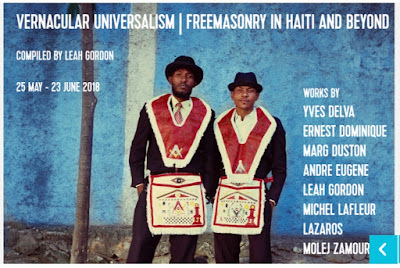 The New York Review of Books over the weekend published a notice of an art exhibition going on in New York City at the Clemente Center this month about Freemasonry on the island of Haiti. "Haiti, good historians agree, is where the Enlightenment came home to roost. France may have been where Rousseau penned The Rights of Man, but it was in France’s most brutal and lucrative plantation colony—the Caribbean sugar island of Saint-Domingue—that a half million enslaved Africans rose up in 1791 to kill their masters and ask the West: How universal, really, is your idea of universal rights? "Saint-Domingue (modern-day Haiti) was transformed, by Toussaint L’Ouverture and Jean-Jacques Dessalines, into a free black nation that France saddled with unpayable debts and whose sovereignty the United States didn’t recognize for decades. But the celebrated “Black Jacobin” revolutionaries were not the whole story of how Haiti came to be. Rousseau’s ideas were not the only influences to shape a society built from the ashes of its old plantations. And among the more mysterious facets of Enlightenment culture to leave their mark here was the secret society that the British artist and documentarian Leah Gordon explores, with several collaborators, in a marvelous exhibition about Haiti’s Masonic tradition, “Vernacular Universalism: Freemasonry in Haiti and Beyond,” now at the Clemente Center on Manhattan’s Lower East Side..."
"In Haiti, during the colonial era, the Freemasons were one of the few European institutions that allowed black membership. Freemasonry still thrives in contemporary Haiti, and its visual world pervades the Haitian imaginary. The symbols that recur throughout this exhibition once tethered a web of ideas that stretched across the Atlantic, encrypting the most precious values of the Enlightenment. "This exhibition aims to visualize the mesh of magic and reason; alchemy and science; trade and metaphysical exchange that has stretched into the 21st century. By focusing on Haiti, this exhibition sheds light on the relationship between colonized peoples and the Enlightenment. It suggests that for some, Freemasonry offered a path to becoming an agent of modernity, rather than its reviled ‘other’. This exhibition will be a timely and significant contribution to an understanding of Freemasonry through the lens of the Black Atlantic." The island of Hispaniola where Christopher Columbus made first landfall in the Caribbean has had a curious Masonic past. Controlled by Catholic Spain during the early colonial period, the western half of the island was ceded to France in 1697 as San Domingue — later to become Haiti. When Freemasonry took to ships and started to spread around the globe in the 1730s and afterwards, it came to Hispaniola, too. But it took longer on the island than elsewhere because of anti-Masonic policies from the Catholic Church. In 1749, the Grand Orient de France (GOdF) chartered two lodges in San Domingue, and another ten or so were established across Hispaniola by 1789. Meanwhile, Masons in Pennsylvania wasted no time after American independence was declared, and eventually chartered seven lodges on the island of their own between 1786 and 1806. Lodges opened and closed in quick succession in those days, as the colonizing European nations fought each other in their Caribbean territories, as well as back at home. While the French Revolution and a decade of slave uprisings and fighting on the island finally brought independence to Haiti after 1804, organized Freemasonry on the island wouldn't manage to withstand the combined turmoil of revolution and the Napoleon years. Hispaniola was split into two separate countries after 1800, Haiti and San Domingo (later the Dominican Republic in 1844), and Haiti became the first independent nation in the Caribbean and Latin America by 1804. 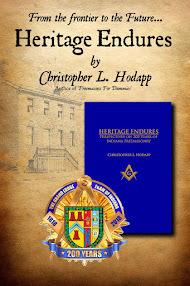 Between 1809 and 1817, four new English lodges were chartered in Haiti, at first becoming a Provincial Grand Lodge, and then declaring independence as the Grand Lodge of Haiti in 1824. But just six years later, the Grand Orient de France came back to the island, importing with them the hauts grades — the "higher degrees." By 1836, there was established a Scottish Rite Supreme Council and the Grand Orient of Haiti, and the competing groups fought for control of the Craft degrees. Remnants of that battle continue to this day. Meanwhile, on the Dominican side of the island, the Grand Lodge of the Dominican Republic was formed in 1865. "When Haiti won its independence, and utterly abolished slavery at the end of the 1791-1804 Haitian Revolution, Masonry was so ingrained into local culture that the all-black revolutionary government inherited the Craft amongst their other spoils of war. "François-Dominique Toussaint Louverture, the former slave who led the revolutionary forces against the French, is himself reputed to have been a devout freemason. His own signature seems to attest to the fact, with its combination of two lines and three dots that mimic a popular Masonic shorthand symbol of the time. In fact, some sources claim that Masonry was so integral to Haitian culture and leadership, than any president of the country who was not a Mason prior to office was ordained on the occasion of their election. "Meanwhile another of Haiti’s founding fathers, Jean-Jacques Dessalines — the self-styled “Emperor Jacques I of Haiti” — was similarly invested in the Craft. 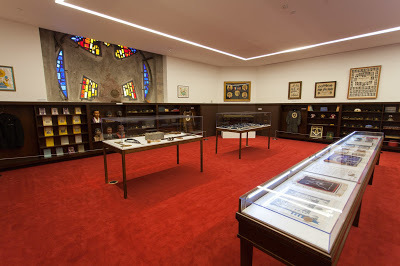 The National Museum of History, in the center of Port-au-Prince, houses artifacts such as the slave-turned-emperor’s own sword and scabbard, clearly engraved with square and compass motifs..."
Freemasonry today prospers on Haiti,. 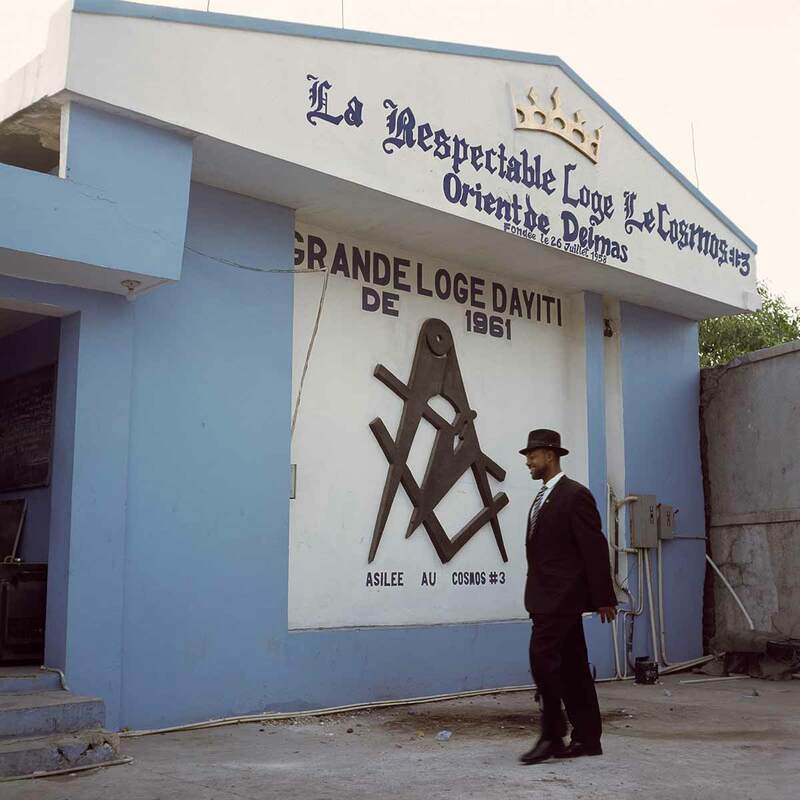 The Grand Orient d'Haiti currently lists 50 lodges with 9,700 members on its rolls, and they are widely recognized around the world as regular. They are currently recognized by all US and Canadian grand lodges, and the UGLE. 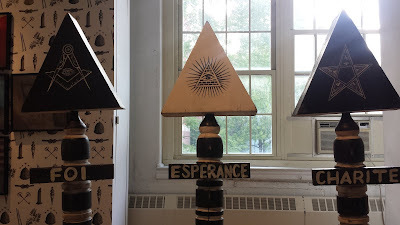 For a more personal description and photos of the New York exhibition, also have a look at The Art of Haitian Freemasonry by 'acorngrove' on the Steemit site HERE. The Clemente Center is located at 107 Suffolk Street in New York City. The exhibition runs until June 23rd.